You all are already blowing me away and it's only been one day! There are over 100 people signed up for the challenge which makes me so happy. This kind of thing is so much fun when you are doing it with friends right? Are you ready for your second prompt? Journal Prompt: This is something that I do in all of my journals. I love making tangible goals and I love writing out lists so this is always a perfect page for me. 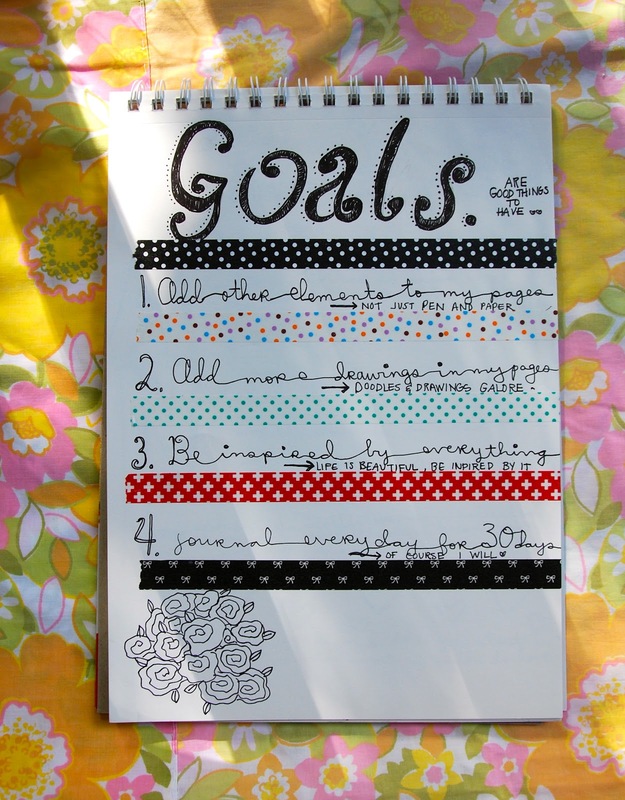 Use this page to create 3-5 tangible goals for this journal challenge. I can't wait to see your goals! This is really pretty. I wish I had pretty tape. I need to invest in some. Definitely!!! Target actually has some really great tape in their Kid Made Modern stuff!!! I'm at it again with the mistakes! I posted this commented on the wrong post before this. Argh. All finished! It was so much fun - can't wait for tomorrow's prompt! I am so glad that you are having fun with this!! Your pages look awesome!! oh, I'm going to join as well! Hope today do the missing pages!